True Thompson's Photo Is Revealed and....It's a Baby! She is crowned by an Instagram filter, per Kardashian protocol. 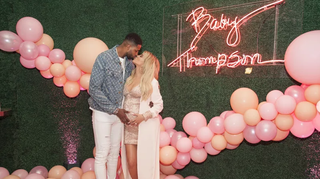 So now we know Khloé’s baby True Thompson. What is she up to now? Is she pooping, sleeping, crying, raging like Stormi or getting hair extensions like Dream? We (the world) will be following developments forever until we die.